During a press conference at last week’s Heli-Expo convention in Las Vegas, Kamov general designer Sergei Mikheyev dropped something of a bombshell when he revealed that the Kamov Design Bureau had produced the initial conceptual design for China’s Changhe (CAIC) Z-10 attack helicopter. Having made its public debut at last year’s Zhuhai airshow, the Z-10 is in the early stages of production and has entered service with at least one Chinese army unit. Mikheyev, who is also president of the Helicopter Industry Association of Russia, stated that in 1995 China asked Kamov to secretly undertake the basic design of an attack helicopter, which was known internally as Project 941. Presentation slides revealed graphics and wind-tunnel models of the project, showing it to be similar to today’s Z-10. Mikheyev noted that the Kamov project was handed over to China as a program ready for development, and he praised China for subsequently bringing the Z-10 to fruition. While the announcement came as a surprise to many, experienced China-watchers had an inkling of Kamov’s involvement as long ago as 2007. At that time, a commenter on a Chinese forum purporting to be a former Kamov employee claimed to have worked on the design. Furthermore, the commenter outlined the scale of Kamov’s brief, which covered general arrangement and aerodynamics, structure and powerplant arrangement, and weight calculations. 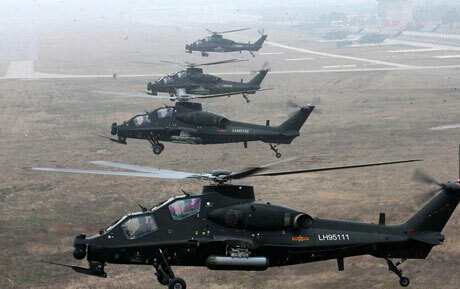 China supplied a basic set of requirements, including the specification of General Electric’s T700 engine (as used in the Black Hawk) and a 23mm cannon. Mikheyev’s revelation adds another element to the story of international assistance in the Z-10 program, which has been afforded a high priority by the Chinese authorities. Around the same time as Kamov was developing the basic concept, what later became the China Medium Helicopter program was launched for a six-ton machine ostensibly for civilian duties. Whether this was ultimately a cover under which the dynamics for an attack helicopter could be developed or was a genuine program is unclear. However, Western companies were involved in the development, with Eurocopter France committing in May 1997 to assist with the rotor system and AgustaWestland securing a contract in March 1999 to help with the transmission. Some reports suggested that at least prototype transmissions were supplied from Italy. The Z-10 was designed with a universal engine bay and the first five prototypes were powered by two Pratt & Whitney Canada PT6C-76C turboshafts. The United Technologies company and subsidiary Hamilton Sundstrand were together fined $75 million in June 2012 for violating U.S. arms export controls by earlier providing 10 PT6Cs and associated Fadec software to China. The Z-10 has also been powered by the Russian Klimov VK2500 and Ukrainian Motor Sich TV3-117. The latter appears to be installed in current-production aircraft, and Motor Sich is reportedly assisting in the development of the indigenous WZ9 turboshaft that is ultimately intended to power the Z-10. It is also known that the South African company Denel was involved in the Z-10 development, apparently assisting with stability issues around 2000. Persistent talk suggests that China tried to buy a complete Denel Rooivalk attack helicopter during the course of the Z-10 development program.